Located just outside of Rochester in Monroe County, New York, Brighton is a town of about 40,000 residents. There is plenty to do and see in Brighton with bicycling tours of the Erie Canal and visits to the Genesee Valley Park for hiking and outdoor beauty. Cold winters make Brighton a great destination for anyone who loves ice skating or snow skiing. This town is also a great place to be when a dental emergency strikes. Brighton offers access to general dentists, dental surgeons, periodontists, and orthodontists who are standing by to care for your dental problem. The Emergencydentistsusa.com website makes it simple to choose a great emergency dentist in Brighton. Just log onto our comprehensive website and scroll through a specially selected listing of emergency dentists. Get the dental office hours, driving directions, and even insurances accepted right at your fingertips. The Emergencydentistsusa.com website provides you with everything you need to choose a new emergency dentist and make that first appointment. When you need a little more help selecting that new dentist, call our 24-hour dentist finder hotline. Speak with a caring agent who is standing by to help you choose a dentist, set up that first appointment, and to offer you driving directions if you need them. This phone call is always completely toll-free. Remember to bring your photo ID and dental insurance card with you to your first dental appointment. Try to arrive at least 15 minutes early so that you can fill out the new patient paperwork. Brighton is a beautiful town for anyone who loves outdoor adventure in the summer or the winter. This New York town is also a great place to be when a dental emergency strikes unexpectedly. Scroll down to see some of our top dental office choices for your dental emergency. Description: Located just outside of Brighton in Rochester, NY, White Spruce Dental is a great place for a dental emergency. Two caring dentists and a kind office staff make each visit a relaxing experience. This dental clinic provides a lifetime of healthy smiles with same day dentistry and cosmetic services. 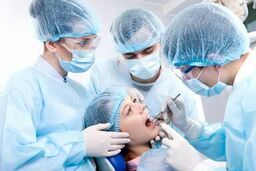 Description: With a variety of dental specialists, including an oral surgeon, Aspen Dental in Rochester is a great choice when you have a dental emergency. This full-service dental clinic offers restorative care along with cosmetic dentistry. Denture services, dental implants, and digital x-rays are also provided at Aspen Dental. Description: A large and exciting dental practice provides all of the restorative and cosmetic dental care that any family might require. East Avenue Dentistry PLLC is a great choice when you have a dental emergency. Dedicated to providing you with comprehensive and affordable dental care, this dental clinic is known for its friendly atmosphere. When your terrible toothache pain lasts for more than an hour or two, it is time to visit your Brighton emergency dentist. Any time that a dental problem begins with a fall or an accident, you should first visit a hospital emergency room or urgent care center to be examined by a medical professional. Once you are sure that your injuries are not life threatening, head straight over to your new Brighton emergency dental office to have that tooth problem cared for quickly. Any time you choose a new dentist, it is important to ensure that your dentist is properly licensed and credentialed to work in the state of New York. You can use the New York Dental Association website to check the current licensing of your new dentist. Simply log onto the website and enter your dentist’s name in the search box. View licensing and credentials right online from your own home. You can also see these types of documents on display in your dental office.